When you undergo dental implant surgery at Cornerstone Dental, you can expect comprehensive care that is fully customized to your unique needs and goals. 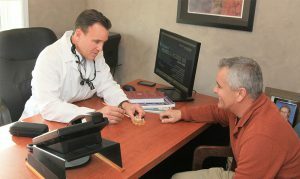 As one of the country’s leading implant dentists, Dr. John D. Beckwith is experienced in creating highly functional and natural-looking tooth replacements with the most predictable outcomes. Utilizing state-of-the-art technology, he and his skilled team are able to carefully plan your dental implant surgery and perform the procedure with the utmost precision. The entire procedure is performed at Cornerstone Dental – from the consultation and planning to the implantation and restoration placement. Dr. Beckwith will educate you on what to expect at every stage to ensure you have a thorough understanding of the process and can make informed decisions about your care. If you are ready to get started with your permanent tooth replacement, please contact us to set up your consultation. During the consultation process, Dr. Beckwith will discuss the different types of dental implants and determine if one of our options is right for you. He will listen to your concerns and what you hope to achieve with your tooth replacement, as well as perform an oral examination and discuss your medical history. This allows him to evaluate your candidacy for dental implants and recommend the best course of action – from a single tooth replacement to a full set of teeth. By conducting a comprehensive consultation, Dr. Beckwith is able to establish the most beneficial solution for your individual case. This is also a great time for you to ask any questions or voice any concerns so he can provide clarification. Once you have had the chance to meet with our implant dentist and go over your tooth replacement needs, he will begin the in-depth planning process. 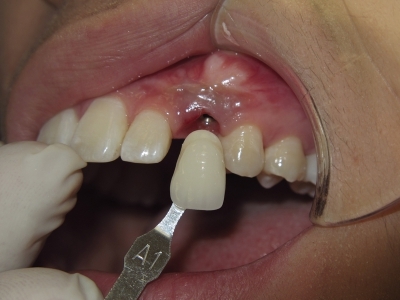 This step of implant dentistry is crucial for achieving a successful outcome. Since every procedure is customized to the exact needs of each patient, Dr. Beckwith utilizes advanced dental technology to plan the more intricate details. Using the ScanX Digital Panoramic X-Ray System, he can see a detailed view of your entire mouth to further assess your candidacy. 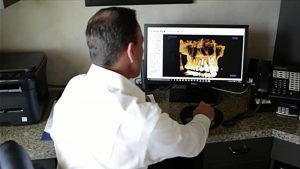 In addition, Dr. Beckwith may perform a CBCT (cone beam computed tomography) scan to examine your oral structures for planning. This provides a 3D view of your gums, teeth, bone, and nerves. By identifying the location and quality of these structures, he can accurately diagnosis and efficiently plan your procedure. Should you need any additional oral work done – such as removal of damaged teeth or bone grafting to improve jawbone density – this will be performed prior to implant placement. Dr. Beckwith is highly experienced at placing dental implants for the most complex of cases. Through computer-guided surgery, he is able to create a map for the placement of each small titanium post. This calculated guide complements his advanced expertise, helping him achieve an extremely high success rate with lower risk of complications. To begin dental implant surgery, you will be given a local anesthetic to maximize your comfort and limit any potential pain. Once this has taken effect, Dr. Beckwith will begin the implantation of the small titanium post into the area of the missing tooth. Depending on the details of your procedure, this may entail one or multiple implants. After each post has been strategically placed, a temporary crown or other restoration is placed to restore oral function until the final restoration can be placed. In the days following your implant surgery, it is normal to experience some degree of mild swelling or bleeding in the gums. Should you experience any discomfort, this can typically be well-controlled with pain medication. The specific details of your recovery will be discussed with your prior to surgery to help you properly prepare. You may be recommended to eat a soft-food diet for the first week until your mouth has had more time to heal. Over the course of three to six months, your new implant posts will gradually osseointegrate, or fuse, with the jawbone, becoming a permanent part of your mouth. Before the final restoration can be placed, Dr. Beckwith may attach a connecting piece to the top of the implant post. This will allow the gum tissue to heal around the connector, helping the dental crown to securely and aesthetically be attached. The final step of your dental implant procedure is affixing the dental crown. This is a custom-crafted restoration that is specially designed to restore your oral function and feel like your natural tooth. The restoration is color-matched to the rest of your teeth to seamlessly blend with the rest of your smile. In addition to performing the entire implant procedure at his office, Dr. Beckwith is also referred to by other oral surgeons to complete the process with his aesthetic restorations. Once patients have completed this final step, they can look forward to beautiful and functional results that can last decades. Implant dentistry is the most advanced tooth replacement technology to date, and its benefits are incomparable. When you choose a dental implant for your tooth replacement, you are receiving one of the most reliable, cost-effective options available. You can also prevent many of the side effects associated with untreated tooth loss. Since dental implants replace the entire tooth – from the root to the surface – you are helping preserve your jawbone density by preventing it from deteriorating over time due to lack of stimulation. Implants are also preferred over less permanent tooth replacements because they do not affect the adjacent teeth. Implants fill the gap to prevent nearby teeth from shifting, and they do not require preparation of the neighboring teeth like what is needed to support a bridge. Perhaps one of the greatest benefits of dental implants is their permanent nature. When you choose a highly experienced and extensively trained provider like Dr. Beckwith, you can expect your results to last for up to 20 to 30 years, if not longer. No extra daily maintenance is required. They should be cared for as if they were your normal teeth with regular brushing and flossing. If you maintain good oral hygiene and attend routine dental examinations, your new smile can last a lifetime. Having undergone extensive post-graduate training and performed such a high volume of dental implant procedures, Dr. Beckwith has become proficient in placing implants and beautifully crafted restorations. 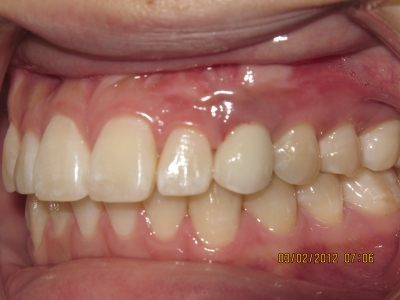 He is committed to providing excellent results, which is apparent when you browse through our patient gallery. If you are interested in the life-changing benefits dental implants can provide, please contact us today to schedule your appointment.